I know what you’re thinking: do I really need another cleanser? The answer is yes. Yes, you do. Contributing writer Casey Sharbaugh wrote about her affection for Allies of Skin Mollecular Savior Toner Mist, and, tbh, my interest was piqued. So when the brand sent me some goodies for my sensitive/ combo/ acne-prone/ angry AF skin, I jumped at the chance to integrate the products into my skincare regimen. 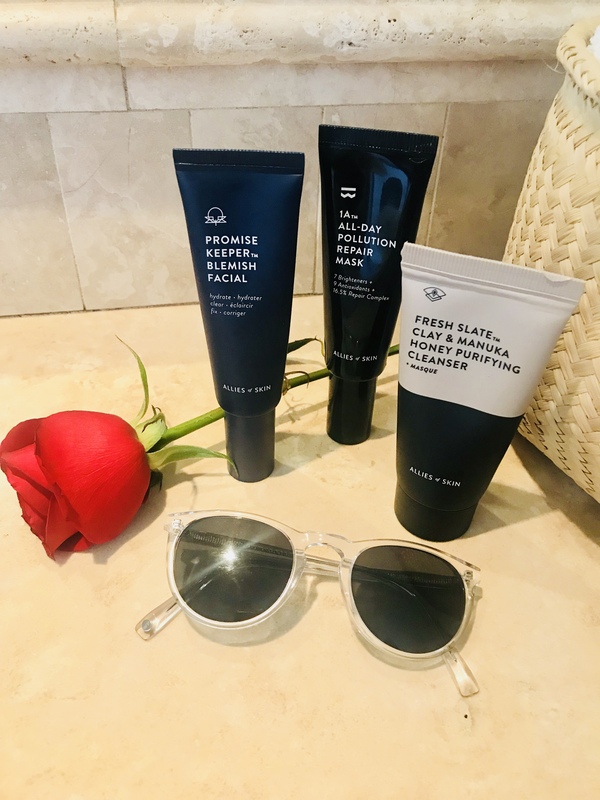 The first product that caught my attention was the Allies Of Skin Fresh Slate Purifying Cleanser + Masque — and that brings us to this post. It’s technically a cleanser, but it works wonders as a quick 10-minute purifying mask that won’t overdry or strip the skin. The consistency is a bit gooey like honey (hence why honey is a main ingredient, along with clay, but we’ll get to the latter later), so it doesn’t really lather; it more melts into the skin, gently (key word) removing impurities while also hydrating, thanks to safflower oil, which is a brilliant oil for oily and acne-prone skin types (it’s a 0 on the comedogenic scale). (Psst: read all about our love for honey as a powerhouse skincare ingredient here.) I apply the cleanser to dry skin, then add a bit of water to rub it in and produce a slight foam. I then leave it to do its magic for one to two minutes before rinsing off with lukewarm water. The result is a brighter, smoother complexion and zero breakouts. In fact, the honey and clay aid in unclogging congestion and soothing sensitivities due to breakouts. When my skin is really acting up, which seems to be every other day as of late, I use the Fresh Slate Purifying Cleanser + Masque as an actual mask, applying a generous layer to dry skin and leaving on for ten minutes. BTW, this stuff smells a bit like chocolate, thanks to cacao antioxidants, which fight free radicals and promote collagen (all that good anti-aging stuff). So not only does it smell like dessert, it leaves skin looking cleaner, more youthful, less congested and irritated, and it’s giving me long-term benefits. My only issue is that I seem to use a lot of the cleanser for each wash so it doesn’t look like the tube is going to last very long, but considering it’s a two-for-oner (cleanser and a mask), I guess that makes sense. Regardless, this has quickly garnered itself a space on my bathroom shelf — and I will be replenishing when it’s gone. It’s that good.Stay tuned for more reviews on additional products in the Allies of Skin range.